The perfect way to start your day Sunday. 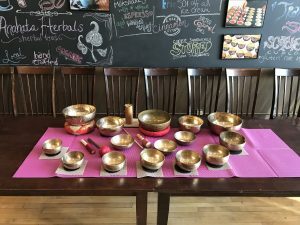 Experience the bliss of a sound meditation and then stay and treat yourself to breakfast, cinnamon rolls or cupcakes, tea or coffee. Give yourself the gift of meditation to begin your week. Come early; doors open at 9:45 am. Find your place and settle in to experience the vibrational bath with the bowls. Doors lock at 10:00 am to guarantee an uninterrupted meditation. Half Baked opens for business at 10:30 am. Purchase breakfast, stay to enjoy the cinnamon rolls, muffins or cupcakes and coffee of tea or take your treats to go.